HarvestPro was founded in 1998 by managing director Zane Cleaver, and executive chairman Andrew Chalmers. 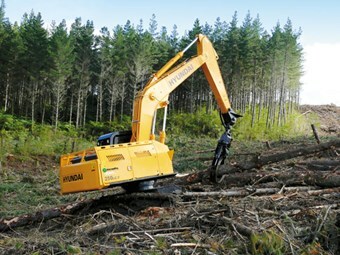 The company has evolved from a forestry engineering consultancy to a harvesting company. 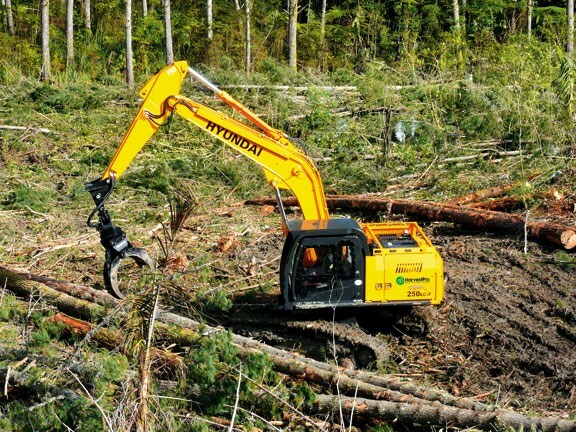 Today HarvestPro produces around 600,000 tonnes of wood per annum. The greater percentage of which is exported to China, but Zane says a reasonable amount of volume is utilised domestically. HarvestPro employs 150 workers spread over 12 harvesting operations. Six operations are located in Northland and six on the east coast. Staff include a harvesting manager in Northland, a harvesting manager in Gisborne plus a foreman for each of the harvesting operations. As far as servicing machines goes, HarvestPro has its own engineering division, which includes an engineering manager, a procurement manager and seven mechanics. The company runs eight cable logging operations and six ground-based. The engineering team maintains and rebuilds the cable haulers themselves. 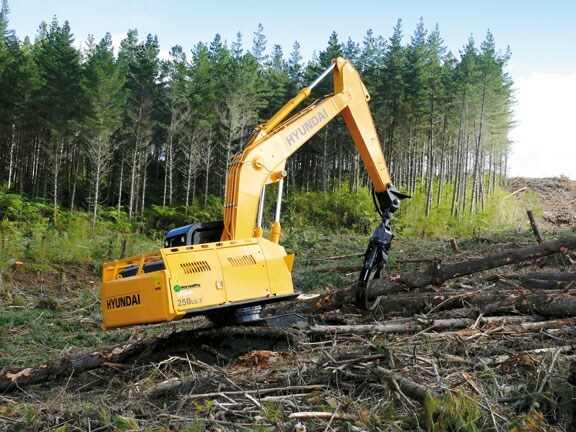 The company operates in excess of 50 major mobile plant items including excavator-based log loaders and harvesters, log skidders, crawler tractors, wheel loaders and mobile haulers. 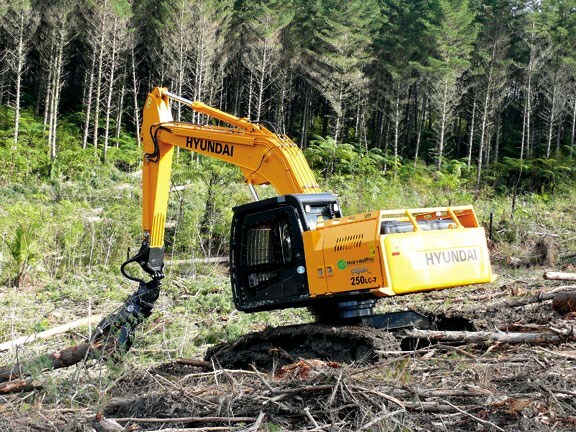 HarvestPro had previously been running a mixture of excavator brands, however Zane says the idea of naming a key supplier was to reduce the age of the fleet and improve productivity and efficiency. He says reliable machinery is key to the company’s growth and it’s important that there is never any downtime. 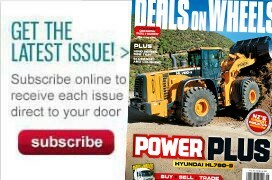 "Downtime is something you can’t recover particularly in a harvesting business and Porter’s are guaranteeing us 98 percent up time." As part of the agreement each machine will be replaced at just 6000 hours (around three years). Currently HarvestPro runs five Hyundai Dash 7s and all operators have been very happy with their performance and comforts. As part of this new arrangement, HarvestPro has requested the new Dash 9 excavators particularly because of their GPS system. "With the GPS we can better analyse our business. It can tell us how much static time versus working time there are on those machines. Now we can understand what’s really happening out there." Zane says it’s not about monitoring his operators but rather about educating them. "With the GPS system we can find out if the operators are using the machines as efficiently as they could be, if not, we can rectify the problem." The GPS also provides an alarm system. The alarm will notify send a text message to Zane if there’s a malfunction or if the machine is overheating. The text will tell him the machine’s location and the problem incurring. All information from the GPS system is downloaded to a database and translated in to reports. Zane says they are planning to gain access to the raw data from their central database to develop their own reporting system in order to drill it down for more complex purposes. Lubrication fittings – All lube fittings are centralised and in close proximity to each other for easy service. Easy to maintain engine components – The cooling and pre-heating systems are designed for optimal and immediate operation, guaranteeing longer engine and hydraulic component life. 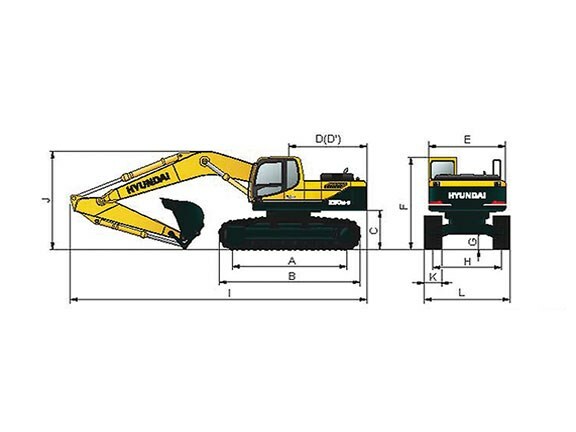 Servicing the engine and the hydraulics has been considerably simplified due to accessibility. Cummins QSB6.7 Engine – The six-cylinders, turbo charged, four-cycle charger air-cooled engine is built for power, reliability, and economy. This engine meets TIER 3 emission regulations. Track rail guard and adjusters – Durable track rail guards keep track links in place. Track adjustment is made easy with standard grease cylinder track adjusters and shock absorbing springs. Strong and stable lower frame – The reinforced box-section frame is welded using low-stress, high-strength steel. The X-leg type centre frame is integrally welded for maximum strength and durability. Reinforced bucket and bucket linkage – Sealed and adjustable bucket linkage produces less wear of pins and bushes and offers silent operation. 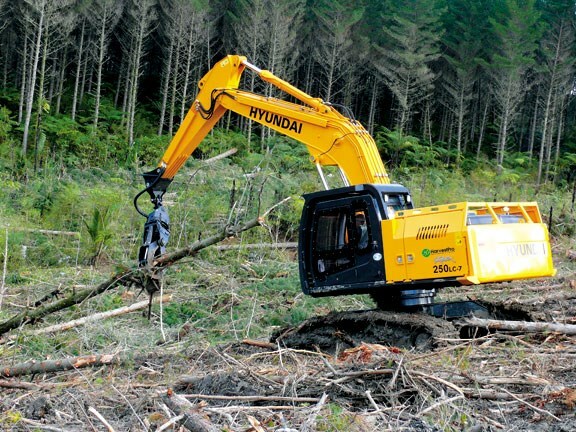 See a range of Hyundai excavators for sale here.